Sadly we left Guanajuato this morning. It would have been nice to have a few more days to wander the streets, alleys, and tunnels but the temples are calling so we packed our bags. Once we were more-or-less together we decided to take advantage of the free continental breakfast. Admittedly it wasn't much but that was fine with me, I didn't want to need the bathroom too urgently on our day of travel. Initially we were planning on taking a later bus out of town but we were ready so we caught the earlier bus to Mexico City. It wasn't as luxurious as the last bus we took and it was a lot more crowded but it was a bit cheaper than the last one we took to Guanajuato. Once in Mexico City we had the option of taking another bus to Teotihuacan or take a taxi. We opted for the taxi thinking it would be quicker. That was true and when we arrived in Teotihuacan we discovered that the bus is really just a van and felt a bit of relief that we didn't try that route because it would have been difficult with our bags, especially considering that they were packed in. After a little confusion our taxi driver found our hotel. The proprietor wasn't around but they was a group of locals using their common area and one spoke English well enough to help us find a room. I suppose he will leave a note for the owner to let them know we're here. We also asked about where to eat and he brought back a nice woman who was cooking for the group who said she would make us dinner for forty-five pesos each (that is less than four dollars). She even brought a little sample which helped to seal the deal. Fifteen minutes later we were sitting in the common room sipping glasses of guava juice. Soon we were presented with plates of rice, a big bowl of beans, a stack of hot tortillas, and I was given a bowl of nice scrambled eggs while Francene and Araceli got beef stew. To finish it off was a slightly sweet and spicy salsa that was delicious. It was a lot of food and we pretty much cleared our plates. All was excellent and very filling; a steal at forty-five pesos. With dinner completed we went for a walk through the town. There are metallic buntings that crisscross the streets and in the evening light they sparkled. I don't know if they were part of their Dia de los Muertos celebration or for something else entirely but I liked the effect. As we wandered it quickly became obvious that we're the only foreigners around town but it seems safe in a small town way. We even found a bakery that was still open and bought some pastries for breakfast tomorrow. Given that it was a long day of travel we headed back to our hotel to play on the slow internet and get ready to turn in early. 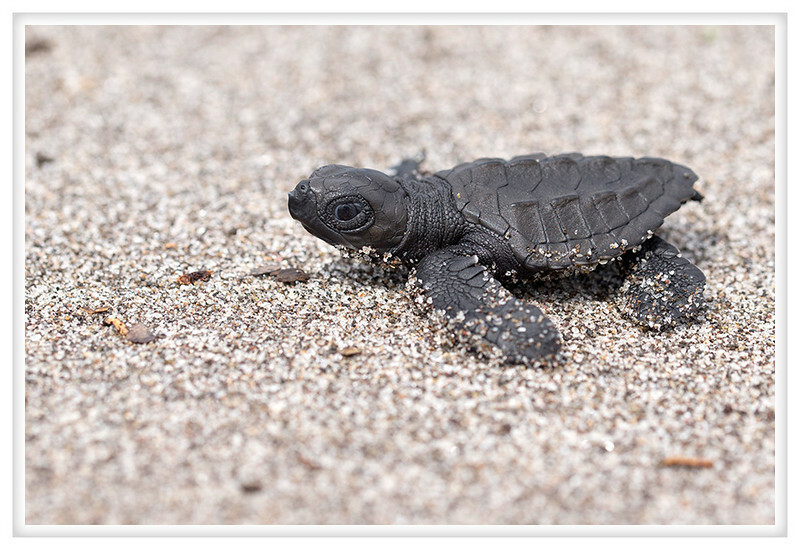 Below is another one of the baby sea turtles we released in La Libertad. These little guys are so cute and I keep hoping that they all made it safely past the predators to the open ocean. That is probably as close as I will ever come to praying.